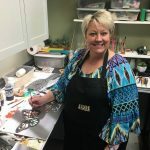 Lori’s Line consists of designs created and stained by Lori, Jimmy Don’s wife. 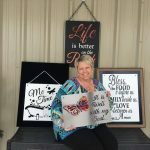 She’s created these designs that are true to her roots and passions that she wants to share with each of our customers. Staining and customizing these designs is one of her favorite parts of the job. We’ll often times find her staining and decorating designs while listening to her music in her office! These designs are true to who she is and what she loves. She only hopes to share a bit of that with each of you. 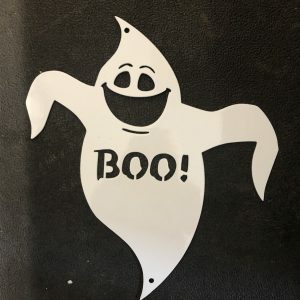 The perfect little ghost just in time for your Halloween decorations! This design has been stained by Lori, making each one unique. Perfect for both indoors and outdoors this design will last through the ages. The perfect addition to your Christmas decor. 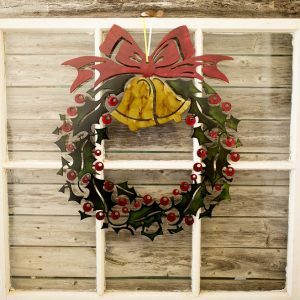 This design is 23″ from the top of the bow to the bottom of the wreath and 21″ across! These orders are made to order and may take 2-3 weeks for delivery. For rush orders or to see if we have one available for immediate shipping, please call 254-486-9150 to check on availability. This piece is sold as a one of kind product and there is only one available for sale. 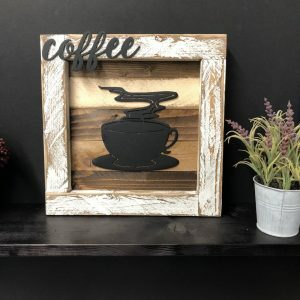 Featuring our copper hammertone coffee and coffee cup design on a white shutter. This piece is sold as a one of kind product and there is only one available for sale. 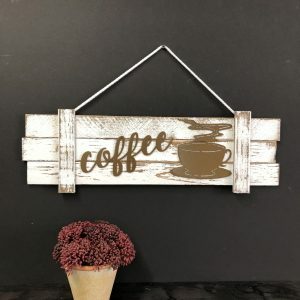 Featuring our coffee cup and coffee script design in our Black finish on a white picket frame. © 2017 JDH Iron Designs. All Rights Reserved. *Limited period offer. One time use/person, and excludes custom designs.